We live in times marked by much confusion and apprehension. In this landmark book, international scholar and author Vishal Mangalwadi offers a radical vision for the gospel's power to heal Western society. With insights drawn from real-life struggles against corruption and years of study, he delves into the ideological roots of social oppression. Reform, he argues, is never without controversy. Yet, reforming a culture's values is a necessary precursor to lasting liberation and hope. Vishal Mangalwadi (1949-) MA, LLD, is an international lecturer, social reformer, political columnist, and author of thirteen books. Born and raised in India, he studied philosophy at universities, in Hindu ashrams, and at L'Abri Fellowship in Switzerland. In 1976 he turned down several job offers in the West to return to India, where he and his wife, Ruth, founded a community to serve the rural poor. Vishal continued his involvement in community development serving at the headquarters of two national political parties, where he worked for the empowerment and liberation of peasants and the lower castes. In demand worldwide, Vishal is a dynamic, engaging speaker who has lectured in 32 countries. He enjoys simplifying complex ideas and inspiring despairing hearts with hope. "A tour de force from someone who sees us from the outside as well as the inside." "There is urgency about Vishal's excellent argument... His logic is impeccable and forceful." 'The current worldwide economic crisis shows what happens when distrust rules nations. 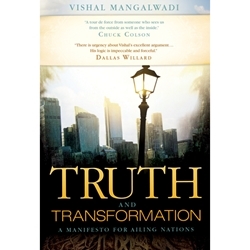 Vishal Mangalwadi illuminates the path to restoring trust by embracing truth."